The interplay between the roles of observer, observed, the outsider and the everyday were explored by Fiona Davies in a recent month long residency at Caravansarai in Istanbul, Orhan Pamuk expressed these tensions in his memoir, Istanbul, Memories and the City . He describes how when his cousin opened the window, ‘ … it was usually to spit on the roof of a car struggling up to the tope of the alley, or throw a nail or a firecracker he had skilfully attached to a string. Even today, whenever I am at a high window that looks out onto the street, I can’t help wondering how it would feel to spit down on passersby’. The Blood on Silk project pairs the seemingly unrelated, In this residency Davies investigates the overlay of trade; the older silk trading routes with the newer routes for bio-products including blood. The work she produced during the residency includes meditative, almost abstracted video works. 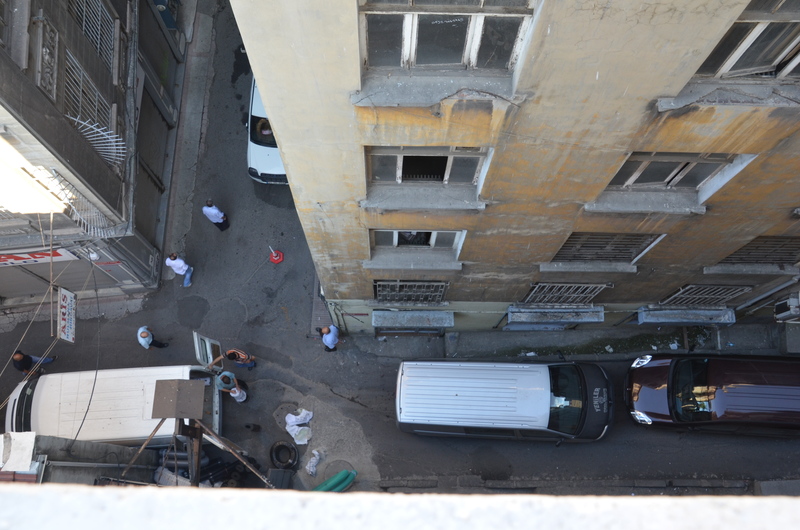 Shot from the rooftop terrace of the residency down six floors to the street where hardware shops are opening up in the morning. The choreography of the street is slowly revealed as each prepares to trade. Fiona has now resumed her artist residency at Culture at Work in Sydneyto develop these works among others. Next postAn Interesting Thought – Study of the Bacteria resonsible for the Plague shows it followed the Silk Road to Europe from China.